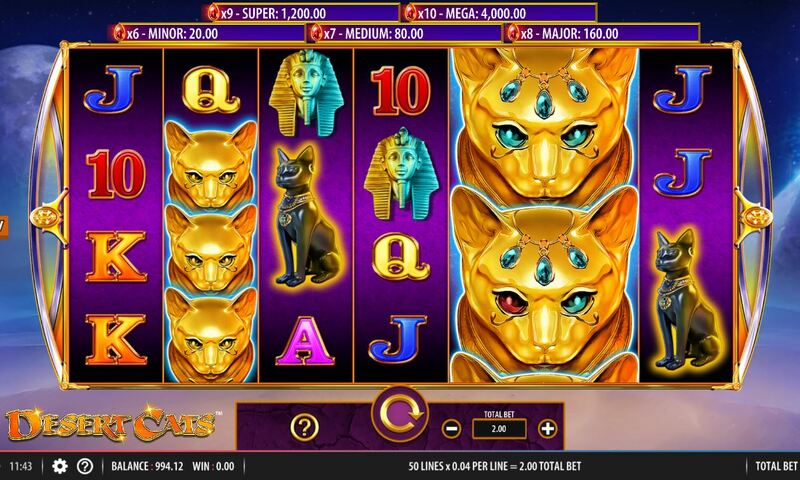 Desert Cats slot joins WMS' ever-growing legion of Egypt-themed slots alongside Egyptian Riches and Lady of Egypt although it's highly likely IGT have made even more as American developers seem to love this ancient desert land. Here we have a background of the Great Pyramids at night, minus all the biting mosquitoes I saw and felt when visiting them at that time once and naturally we have some gentle Egyptian music to soothe us while we spin, with a soft drum roll when they come to a stop. Will these desert cats manage to get their claws into our precious bankroll though? The fact that immediately springs to our attention here is the 7-reels Desert Cats has, of 4-rows each with 50 paying lines. Symbols are pretty much what one would expect of the Egypt theme and I'll possibly depress some readers when I tell you all the 7-of-a-kind pays! The best 2 icons are the suspiciously transgender young Pharaoh or the Golden Cat Wild paying, wait for it, 4x bet each! I am shaking with excitement. After those mega-pays we have the Black Cat at 1x, Pharaoh's Mask, Rosetta Stone and Ankh all at 0.4x and 5 card values all paying a titanic 0.37x. It doesn't take a genius to figure out that with such an impoverished pay table that the wins must be relatively easy to get. You are assisted each spin by being guaranteed that 2 adjacent reels will always consist of a pair of 2x2 block Golden Cat Wilds, with the other reels having them on singly. These Golden Cats do have another role as we shall discuss shortly and to be truthful if it wasn't for that I may as well stop this review now for all the drama in this game. On all reels you have a Lion singly which triggers 5 free games for three in view, 10 for four and 50 for all five that are possible due to 2 of the 7 reels having the Wilds on. You don't even get a pay for three, 10x for four and a mighty 15x for all five. 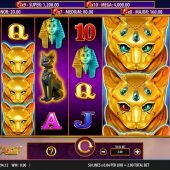 The enhancement in these free spins is that now you get two pairs of adjacent reels consisting of 2x2 block Wild Golden Cats. Obviously it's better they fall on reels 1 to 4 for guaranteed minimum 5-of-a-kind pays but as only 3 reels aren't Wild now you can only get 3-scatter retriggers for 5 extra spins. You now have the opportunity to get multiple lines of those monster symbol pays. 6 = Minor 10x bet. 7 = Medium 40x bet. 8 = Major 80x bet. 10 = Mega 2,000x bet. Desert Cats slot sadly follows WMS' recent practice of making 'big reels' games with many paying lines and correspondingly tiny line pays and next to no potential. This also occurred on Knights Keep and Forbidden Dragons before this game and here the absolute top pay on a perfect spin of Wilds and stacked androgynous Pharaohs is merely 200x bet. Players must have some belief that within all the flashy symbols and animations that there should be the chance somewhere of leaving with a nice win but this simply isn't the case here.